The EM-XSW 1 Dual-Channel Stationary Receiver with Internal Antennas from Sennheiser is a 2-channel analog UHF wireless receiver. It can be used for singers and presenters when paired with an XS wireless 1 series handheld transmitter and microphone capsule (sold separately). The dual-channel receiver is designed with ease of use in mind and is well suited for DJ, church, and school applications. 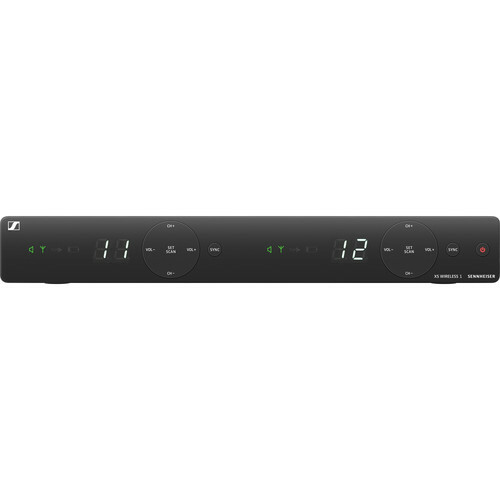 Each receiver channel is built with antenna-switching diversity reception and features automatic frequency management and synchronization via remote channel. Up to 10 compatible channels are available. Additionally, an AC power adapter is also included. Box Dimensions (LxWxH) 14.7 x 10.8 x 3.5"